This fall, I visited a local wholesale company in Bucks Country, Peace Tree Farm. This remarkable business, owned by Lloyd and Candy Traven, produces all its plants organically without chemical pesticides and herbicides. The Traven’s have committed to organic plant production methods for the last five years. 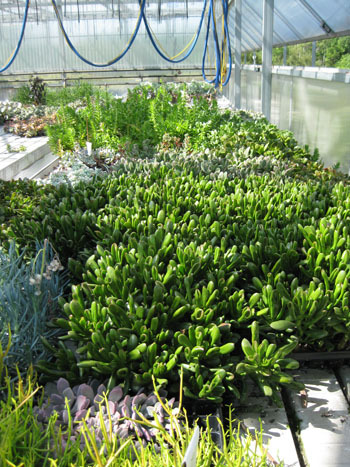 Here at the Scott Arboretum, we are testing many of their practices in the Wister Greenhouse. More to come on these efforts in future posts. In addition to these cutting edge techniques, we are excited because Peace Tree Farm will be custom growing many plants for our Unusual Tropicals and Annuals Sale on May 21-22. 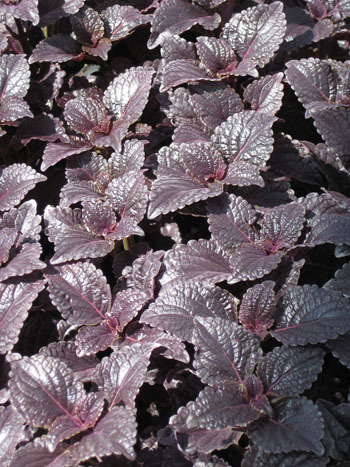 Plants include: cutting edge annuals from nurseries in Israel, Kenya, and throughout the United States, including Petunia ‘Black Velvet’ from Ball Horticulture. They will also produce some heirloom annuals such as the golden foliaged four-o-clock, Mirabilis jalapa ‘Limelight’. 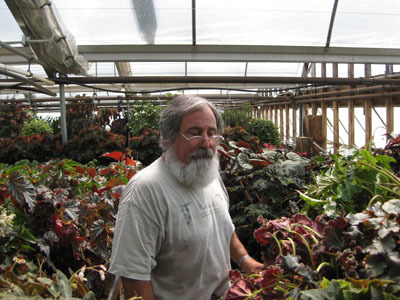 Lloyd Traven is most well known for his cultivation and promotion of begonias, which make both fantastic houseplants, as well as, outstanding plants for the shade and part-shade containers. Traven was featured on The Martha Stewart Show in 2010 promoting begonias for a variety of uses. We will offer some Lloyd’s very best picks such as ‘Art Hodes’, ‘Lotusland’ and ‘Twisted Sister’. The Unusual Tropicals and Annuals Sale will have something for the gardener with large tropical borders and a multitude of pots for the city dweller with a front stoop or a back fire escape, as well as for those who want to adorn their interior spaces with houseplants. Over 200 different plants will be offered such as elephant ears, bananas, begonias, tropical ferns, and bromeliads. A complete list will be available online by April. Over the two-day event, we will have many local container experts including Dan Benarcik and Jonathan Wright from Chanticleer. In addition to the experts on-hand, we will have live planting demonstrations of containers and hanging baskets. To learn about all the education offerings (many free), visit the Unusual Tropicals and Annuals Sale website. Mark your calendar for this first annual sale on May 21-22. Subscribe to Garden Seeds to receive updates and information on some of the great plants we will offering at the sale. – The Scott Arboretum’s Garden Seeds <Loved it!